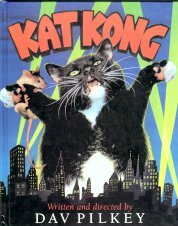 This hardback children's book tells the story of three mice who capture Kat Kong. They take him to Mousopolis and an adventure ensues. Brightly colored illustrations throughout. Copyright 1993, previously owned but in new condition.